As the cashier rings up her purchases, a gunman is busy robbing the bank inside the store. When a customer grabs the robber’s mask, he is shot and everyone runs for cover. Everyone except Shelby, who finds herself face to face with the killer. The next thing she knows, she’s lying on the floor with a bullet wound to her head. Luckily, the bullet only grazes her scalp, and she doesn’t suspect any lasting affects until later, when she suddenly ‘hears’ what people are thinking. With this uncanny ability, her life takes on a whole new dimension. Her kids think she’s bossy and too old to understand them, but that’s nothing compared to her husband. He says he loves her, but what is it about the redhead at work that he doesn’t want her to know? As if that isn’t enough, the gunman knows she can identify him, and he’s out to silence her forever. In her fight to stay alive, she is saved from certain death by a handsome hit-man with ties to organized crime. This pulls Shelby even deeper into danger, where knowing someone’s thoughts can not only hurt her feelings, but get her killed. 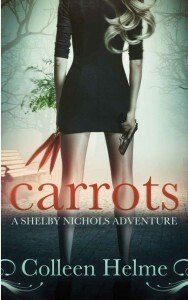 Carrots currently has 4.3 out of 5 stars from 205 Amazon reviews. You can get it free today, January 22, 2014 and January 23, 2014. For more free eBooks, check out our 10 Websites to Download Free eBooks list, as well as our Free eBook of the Day archive.